The New Zealand-born player had to leave the field in the early stages of the game after falling on his shoulder. Boss is likely to be sidelined for two to four weeks and could miss the start of Ireland's Six Nations campaign. 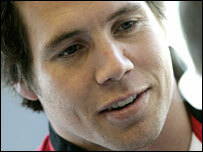 He is also likely to miss Ulster's forthcoming Heineken Cup games against Llanelli Scarlets and Toulouse. Ireland's first Six Nations match is against Wales at the Millennium Stadium on Sunday 4 February. Think its the same shoulder he hurt playing the pacific islands. Bit of rest may be just what it needs. I would. I'd be focking amazed. soft tissue damage and bony brusing to the joint. Ulster scrum-half Isaac Boss's shoulder injury sustained against Glasgow on Saturday was further investigated today . He is suffering from severe trauma to the AC joint in his right shoulder with extensive soft tissue damage and bony brusing to the joint. Yer man Willis looks handy. He'd be fourth or fifth on that list I reckon, in spite of only being a reserve at leinster. Some of the older guys on that list wont play again unless theressome kind ofexplosion atthe nextIrishscrumhalf conference. Where on the list would people put willis at the moment, in the event of a the proverbial sh conference having a gas leak?